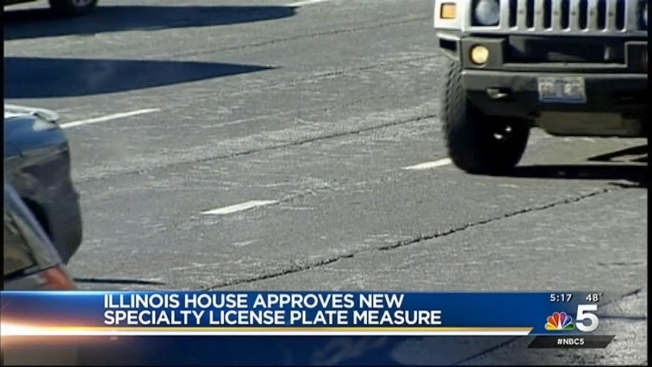 The Illinois House has overwhelmingly approved a bill that would change the way the state creates specialty license plates. The measure passed 108-1 on Monday. If it becomes law, the state would no longer issue new specialty license plate designs for charitable causes. Instead Illinois motorists would purchase large stickers for particular charities and affix them to standardized plates. Already-issued specialty license plates would continue to be valid. Democratic state Rep. John D'Amico of Chicago sponsored the legislation, saying it's difficult for police to identify all of the state's 109 specialty plates. Requests for 59 more specialty plates are waiting for approval. The measure now goes to the Illinois Senate. The Illinois Secretary of State's office says it supports the bill.